I have solved the mystery of 9/11: Lee Harvey Oswald did it! 9/11 had to happen in order to serve those who sit at the top of the human power hierarchy. We’re living on a planet that is being systematically plundered and stolen from beneath us: everything worth owning, from the water, to the pharmaceuticals, to the GMO foods, to the minerals in the ground, to the public services and the entire public infrastructure. Even the air we breathe. It’s not called a war. It’s a transnational corporate financial theft of everything. This is a war being run, of necessity, by deception. Those waging it against you and me don’t want us to know. 9/11 enabled them to pass legislation that greatly increased their power to control us such as the Patriot Act, and the creation of the DHS. Ready for a conspiracy theory? This one’s a doozy! 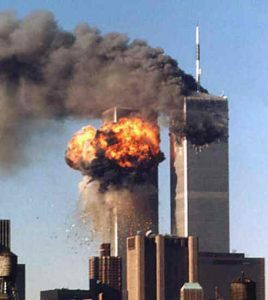 19 disaffected Muslim men armed only with box cutters and led by a sick Saudi on dialysis in a cave in Afghanistan hijacked 4 commercial planes, flew them around unhindered in any way for an hour or so then crashed them into 2 skyscrapers in New York and the US Pentagon, outwitting the most sophisticated intelligence network in the world. Ain’t that a knee slapper? The best explanation for the persistent adoration of the “Official Story” is that people are afraid to think that THEIR GOVERNMENT could commit such a horrible crime. It’s called “Cognitive Dissonance”. However, to a true Psychopath (of whom there are many in leadership positions worldwide) such an event is seen as merely expedient, not a crime at all. The end justifies the means.